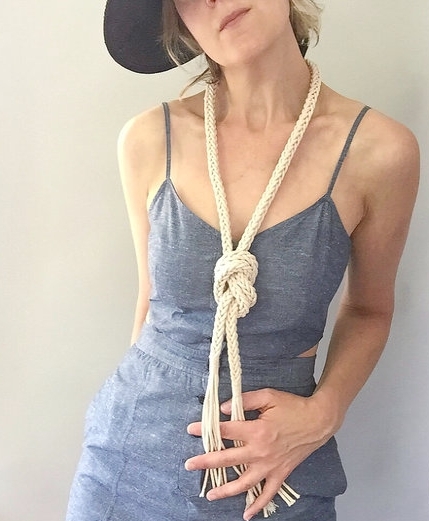 Fiber artist Lisa Anderson Shaffer of Zelma Rose is teaching a class on how to make one of her best selling designs, the Joshua Necklace/Belt. In this class you will learn Lisa's own methods for hand weaving and cord wrapping this versatile fiber design that can be worn a multitude of ways as a necklace and a belt. The workshop will start with instruction on weaving and cord wrapping, and end with knotting techniques to style the Joshua necklace. Each student will be given cotton & hemp cord (enough to make a Joshua Necklace/Belt and to play and create their own design), cotton storing bag, needle and needle book, and printed knot and styling technique info sheet/book.